Kirsten Moore-Towers and Michael Marinaro perform their Free Skate at the 2019 Canadian Tire National Figure Skating Championships. In 2011, Kirsten Moore-Towers stood atop the national pairs podium with then-partner Dylan Moscovitch. Eight years later, she and Michael Marinaro stepped atop it, having won a decisive victory at the 2019 Canadian Tire National Figure Skating Championships. Already the winners of the short program, Moore-Towers and Marinaro‘s Pink Floyd medley free skate featured solid efforts on all elements, other than very slight negative GoE on their three-jump combination after a planned double toe loop was popped to a single. This minor loss of points did nothing to stop them, and they received 131.28 points for the free skate, and 202.75 overall. The throw jumps and side-by-side jump elements were landed, and all lifts went smoothly. And, true to Marinaro’s promise after the short program error, the free skate concluded with a strong death spiral, graded as level 4 by the judges. Despite their win, the duo was not fully satisfied with their performance. Despite her long history in the sport, Moore-Towers noted that many of the pressures they faced in this competition were new. Moore-Towers and Marinaro’s sentiments were shared by Walsh and Michaud, who said that they wanted Moore-Towers and Marinaro, as Canada’s top team, “to have a really good edge” going into the Four Continents and World Championships. Michaud remarked it was “great for Canada” to have as many pairs teams as possible doing well. 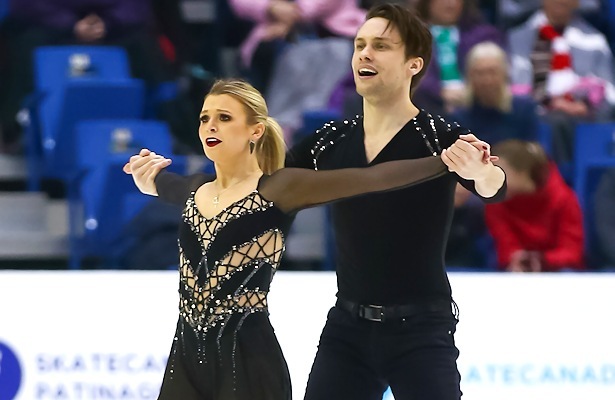 Walsh and Michaud’s own performance of their “Romeo and Juliet” free skate was their best of the season so far, earning them 124.67 points, for 189.87 points overall. Their only negative GoE came on the triple twist (graded as level 2) and an underrotation on their second side-by-side jump element, the triple Salchow. They achieved level 4 on all three of their lifts, as well as on their combination spin. Their death spiral was graded as level 3. “We were so happy with our fifth place last year and we wouldn’t expect to be second this year,” said Michaud on how markedly their situation had changed in the span of a season. The first full senior season had a rocky beginning at the Nebelhorn Trophy and Skate America Grand Prix. The result was all the more impressive given that she was afflicted with stomach flu a week beforehand, delaying preparations. In third place overall with 166.84 points were Camille Ruest and Drew Wolfe, who finished fourth in the free skate with a score of 104.38. Ruest and Wolfe’s performance was, in her words, “bittersweet” with negative GoE on their triple twist, both side-by-side jumps, their throw triple loop, and their closing lift. They took four fall deductions across the program, two of those on the lift, a particularly harrowing moment caused by Wolfe’s blades clicking together. “These things happen, I mean, it’s pairs, and it’s a risk we’re willing to take,” said Ruest. “We’re still learning, and this is a new type of competition for us where we’re in this position,” said Wolfe. “It’s gonna be an experience to take forward.” Ruest agreed, adding that they could do better. In fourth place with 163.28 points were Lori-Ann Matte and Thierry Ferland, who won the junior pairs event the previous year in Vancouver. Justine Brasseur and Mark Bardei placed third in the free skate (105.28 points), remaining in fifth overall with 162.26 points, while Mariah McCaw and Steve Adcock, who finished four in the junior pairs event in Vancouver, finished in sixth place in Saint John with 150.18 points. Skate Canada is sending the top three teams to the upcoming Four Continents, while the top two earned a spot at the World Figure Skating Championships.